Marty and Fran, owners of Renfro Valley KOA, for offering us a Place to Camp and providing us with our trailer. We rode our tandem bicycle with trailer to the Blast in the Valley event on July 4th. We hope you got to see us and that you enjoyed the festivities in Renfro Valley as well. Did you miss the event? Then camp with us on July 31 at the Renfro Valley KOA and send us off on Saturday August 1, when we leave at 10 am on our 7,000 mile journey to Alaska. Follow the link below for directions. Camping with us? Ask for the Pedouin discount when you make your reservations! Mike from Mike's Hike & Bike in Richmond, Kentucky. Mike is freely and genuinely sharing his expertise on bicycling. He keeps true to his store philosophy. 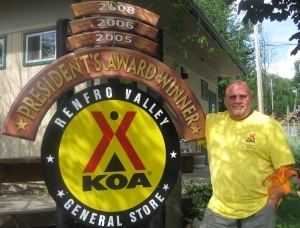 Visit his store to experience Mike's passion for the outdoors. Larry from IMAXradio for setting up a phoneline for a live broadcast every Friday at 2pm EST (20:00 Dutch time). We will call into Larry's radio station with a live report of the preceding week. Make sure you are tuned in! Reruns are on Saturday at 8pm (02:00 Dutch time) and Sunday at 5pm (23:00 Dutch time). Carol from Phoenix, Arizona, USA, read her cheer. Maureen from Berea, Kentucky, USA, read her cheer. Pieter and Ieke from Leeuwarden, Netherlands, read their cheer. John from Louisville, Kentucky, USA, read his cheer. Ernest and Rita from Berea, Kentucky, USA, they have also offered us a place to camp. Ed from Atlanta, Illinois, USA, owner of Harrison Tile. Ed is also sponsoring us with our tires for the journey. Glenda from Berea, Kentucky, USA, read her cheer. Tom and Joy from Berea, Kentucky, USA, they also helped us with bicycle shorts and flashy color water bottles. You can also support the Pedouin journey with a donation. To our neighbors for sharing the road while we practice on our quint bicycle. Hal and Tonya for providing us with Camelbaks, a camping stove with windshield and a water purifier. Jutta, Sergej and Daniel for providing us with a backrest for Robin. Jutta and Sergej have developed a special bicycle seat for a child, so the child can pedal with them. Check out their invention! The extension that makes a family tandem... out of your bicycle! Beth for providing us with a phone with subscription. Discover where we camp! And offer your camping spot so you can share the journey with us! Are you interested in riding with us? Check out the route we will be taking and let us know where you wish to join us. Read the cheers! And add one yourself!